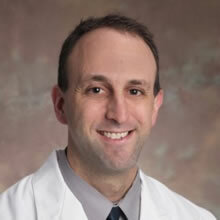 The American College of Physicians has named Emory Healthcare's Daniel Dressler, MD, as one of its 2013 Top Hospitalists. As one of ten hospitalists selected for the honor, Dressler was featured in the November 2013 issue of ACP Hospitalist. He is associate professor and director of education for the Division of Hospital Medicine in Emory University School of Medicine. The publication chose the honorees based on work in the areas of patient rounding, resident education, technology, workload balance, and efficiency of care, among other criteria. Nominations were received from peers, supervisors, mentors and mentees, and the ten finalists were selected by ACP Hospitalist's editorial board members. "Emory is very fortunate to count Dr. Dressler among its faculty," says Bryce Gartland, MD, vice president of operations at Emory University Hospital and interim director of the Emory Clinic Section of Hospital Medicine. "He has been a local and national leader in hospital medicine for over a decade especially in the areas of medical education. This is a well-deserved honor." Dressler joined Emory in 2000 and has held numerous positions since his arrival. He was founding director of hospital medicine at Emory University Hospital and served in that position for five years prior to assuming his current role. As a hospitalist, Dressler is board certified in internal medicine and specializes in the care of hospitalized patients. Emory Hospital Medicine is the largest academic hospital medicine program in the nation. With more than one hundred and ten physicians providing hospital medicine services at nine hospitals in the greater metropolitan Atlanta area, Emory hospitalists account for over 35,000 admissions a year, and total patient encounters exceed 150,000 annually. Emory Healthcare hospitalists are board-certified internal medicine physicians who specialize in the care of hospitalized patients. They are experienced in diagnosing and managing acute medical illnesses that hospitalized patients commonly suffer. They also provide medical consultation for surgical patients.